Hotel Certosa in Milan, thanks to its excellent location close to the tangenziale ovest, in an area well served by public transport, is ideal for business or holiday in Milan. From Hotel Certosa , you can easily reach the trade fairs and Milan centre where are the places of business, luxury, entertainment and culture, as the Dome, Sforzesco Castle, Scale Theatre and art galleries. In addition, from viale Certosa, you can reach in few minutes San Siro Stadium and Palasharp to attend the most important sporting and musical events and what about of the FieraMilanoCity reachable also on foot or RhoFiera just a few metro stops. From tangenzile ovest A50:exit at Viale Certosa and continue in Viale Certosa for approximaly 1,5 km, Hotel Certosa is at the number 26. From Stazione Centrale: from Piazza Duca d'Aosta take bus n. 91 ("Isonzo - Lotto,Circolare Sinistra") for 13 stops. 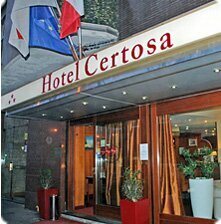 Get off at "Viale Certosa - Viale Serra" and continue on foot for 50 metres, Hotel Certosa is at the number 26. From Orio Al Serio airport (Bergamo): take Orio shuttle, get off at Stazione Centrale. From here pleas read "By train"